I think a pretty journal or notebook cover is important, because it makes you use the book even more. When you want to look at it from the outside, you also want to open it up and work in it! Right? You remember the Japanese word for cute, right? Kawaii! It was such a popular word a few years back in blog land, and it refers to a special aesthetics of childlike cuteness. 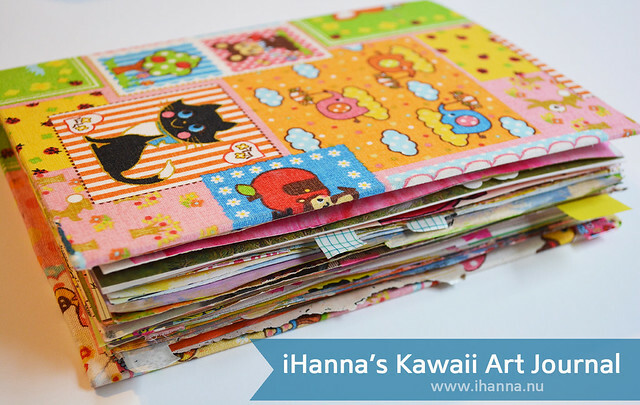 I couldn’t come up with a better name for this Art Journal I made, so I just call it the Kawaii Art Journal! Let’s have a look at it, from all angels. The inside has nothing to do with the Japanese culture of kawaii, because I rarely find myself wanting to draw cupcakes with twinkly eyes etcetera… But the cover fabric, bought online many years ago, is what is so kawaii! And sometimes the cover is the name factor. It is like this fabric have been waiting for this journal to be born. I love all the characters on this print! Love! The first page states that this journal belongs to me, iHanna. And the inside back cover of course has a pocket. I bought a package of library pockets in the scrapbooking isle, and oh I love it! As you know, all journals needs a pocket for extras. That’s a peek at the outside of the journal. 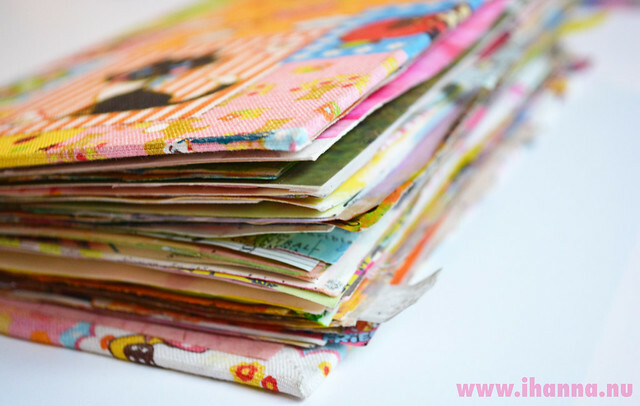 I will share some of the inside pages in upcoming art journal peeks, I promise. 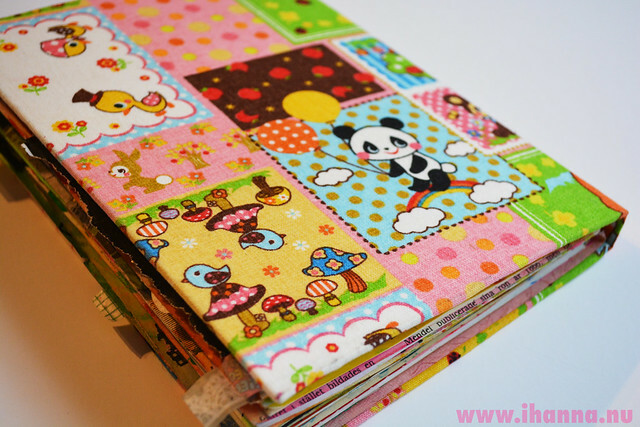 This entry was posted in Bookbinding and tagged fabric, kawaii, pockets, the art journaling life. Bookmark the permalink. I so love your blog and everything you share and as a matter of fact, I have a folder in my email named iHanna and that way I can keep your emails telling me of new blog postings and can then go back to them whenever I want and find what it is that I’m looking for! Agreed so much with you..I love the beautiful decorated journal book and pages , it’s uplift my momentum to put / paste/ draw something that make me happy for the day. 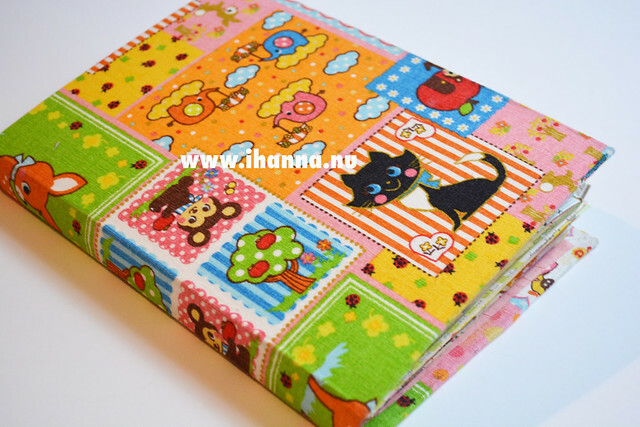 I love that cover fabric, Hanna! Totally bright and “cute,” and makes you want to open it right up. I like your lettering on the title page, too! Wow, such a wonderful journal. I love the bright cheerful colours. Much need to brighten the dull, wet days we are having here. Thank you. 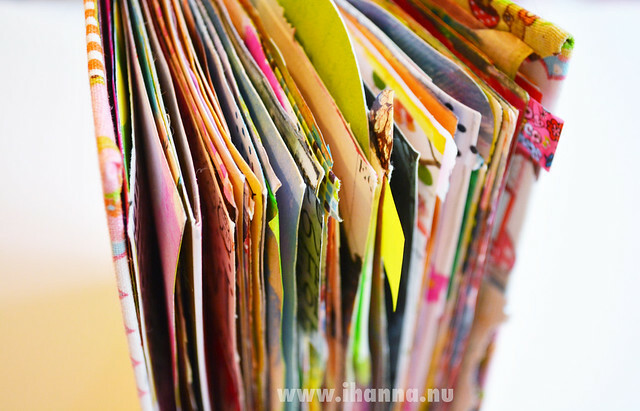 Superb journal Hannah, great name and yes – the butterflies page is wonderful as it is! Looking forward to more peeks!